River Valley sophomore Taylor Huck (7) hits a spike attempt during Game 1 of Thursday night’s TVC Ohio match against Athens in Bidwell, Ohio. BIDWELL, Ohio — A tough night for the home team. 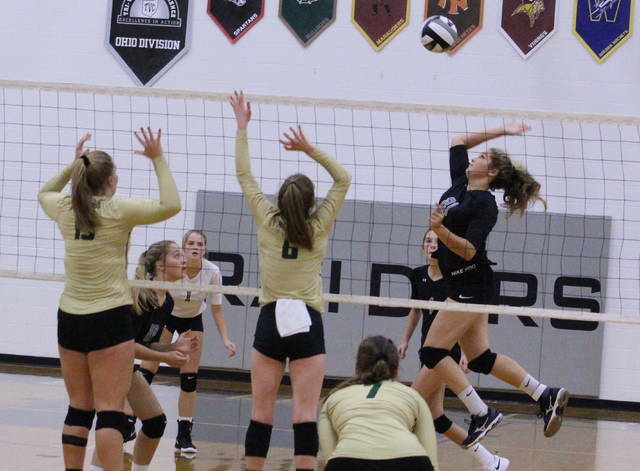 The River Valley volleyball team never led by more than two points in the first two games, then let a 10-point lead slip away in Game 3 before suffering 25-12, 25-17, 25-23 setback to visiting Athens on Thursday night in a Tri-Valley Conference Ohio Division match in Gallia County. The Lady Raiders (7-9, 2-7 TVC Ohio) built a 7-5 lead in the opening game, but the Lady Bulldogs (10-9, 5-3) rallied with nine straight points to take a 14-7 cushion. The hosts were never closer than six points (15-9) the rest of the way and ultimately dropped the opener by 13 points. RVHS opened Game 2 with a quick 2-0 edge, but the Green and Gold countered with an 11-1 run to build an eight-point cushion. The Silver and Black answered with a 10-5 run to close to within 16-13, but were ultimately never closer in the middle game. 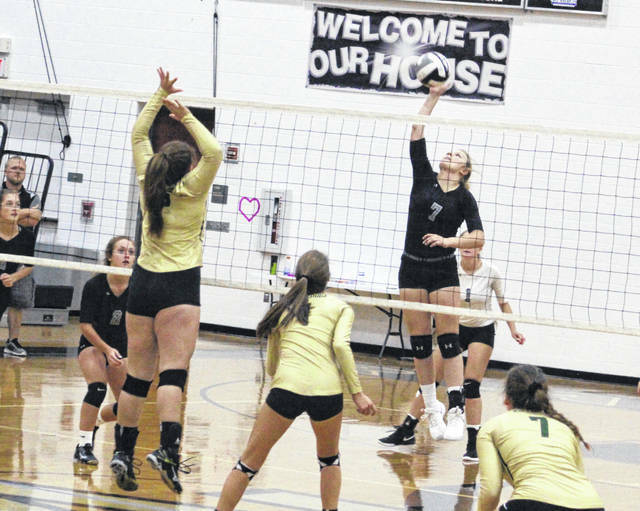 AHS reeled off seven of the next eight points for a 23-14 advantage, then both teams traded to points to wrap up the eight-point outcome for a 2-0 match advantage. There were five ties and three lead changes in the finale, with the Lady Raiders breaking away from a three-all contest by going on a 16-6 charge en route to a 19-9 advantage. The Lady Bulldogs, however, responded with 13 of the next 16 points to pull even at 22-all, then won three of the final four points to wrap up the straight-game decision. Kasey Birchfield and Kelsey Brown both paced the RVHS service attack with six points apiece, followed by Cierra Roberts with four points and Alexandria Wood with three points. Lora Kinney and Mikenzi Pope were next with two points each, while Rachel Horner and Jaden Bradley contributed a point apiece. Birchfield led the hosts with five kills and Pope added four kills. Brown and Hannah Jacks were next with three kills each, with Taylor Huck also chipping in two kills. Brown led the hosts with two blocks and Huck also had a block in the setback. 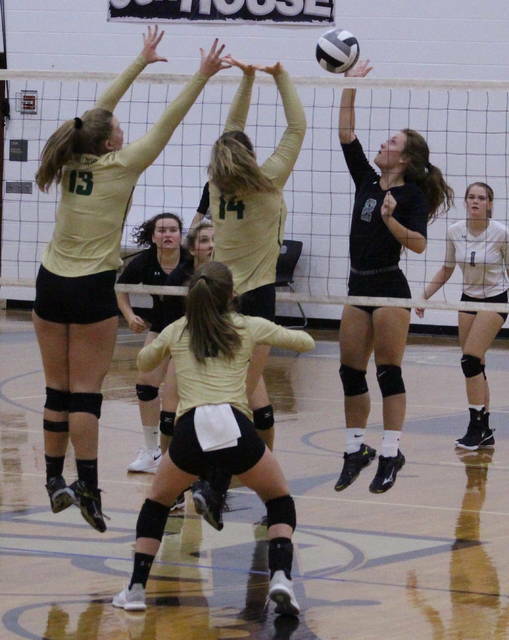 Kaylee Stewart led Athens with 14 service points, followed by Baelyn Carey and Sarah Webb with 11 points apiece. Summer Gilkey also had eight points in the triumph. River Valley returns to action Monday when it hosts South Gallia in a non-conference contest at 7 p.m.